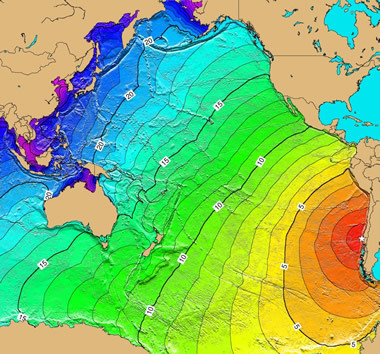 World's largest earthquake - tsunami map: The Chilean earthquake produced a powerful tsunami that traveled at a speed of about 200 miles per hour across the Pacific Ocean. The wave killed 61 people in Hawaii, 138 in Japan, and 32 in the Philippines. The star marks the location of the epicenter, and the numbers on the contour lines are travel times in hours for the wave front. Image by NOAA. Enlarge map. The world's largest earthquake with an instrumentally documented magnitude occurred on May 22, 1960 near Valdivia, in southern Chile. It was assigned a magnitude of 9.5 by the United States Geological Survey. 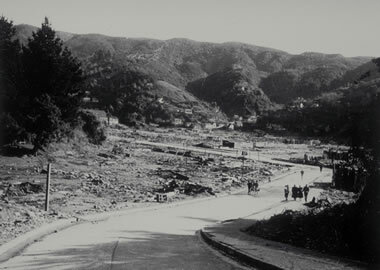 It is referred to as the "Great Chilean Earthquake" and the "1960 Valdivia Earthquake." The United States Geological Survey reports this event as the "largest earthquake of the 20th Century." Other earthquakes in recorded history may have been larger; however, this is the largest earthquake that has occurred since accurate estimates of magnitude became possible in the early 1900s. Largest earthquake - tsunami damage: An aerial view of damage caused along the coast of Chile by the tsunamis. 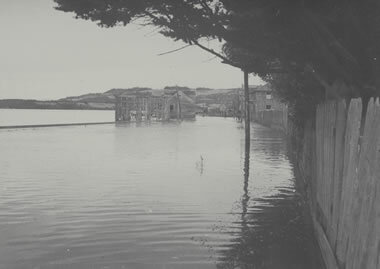 This scene shows part of a coastal community where homes were torn from their foundations and tossed about by the waves. Damage was near total in these areas. NOAA image by Pierre St. Amand. The earthquake occurred beneath the Pacific Ocean off the coast of Chile. Ground motion from this earthquake destroyed or damaged thousands of buildings. The Chilean government estimated that about 2,000,000 people were left homeless. It was fortunate that the earthquake occurred in the middle of the afternoon and was preceded by a powerful foreshock. That foreshock frightened most people from their buildings, placing them outside when the main earthquake occurred. Most of the damage and deaths were caused by a series of tsunamis that were generated by the earthquake. These waves swept over coastal areas moments after the earthquake occurred. They pushed buildings from their foundations and drowned many people. There are many different casualty estimates for this earthquake. They range from a low of 490 to a high of "approximately 6000." Most of the casualties were caused by tsunamis in Chile and from ground motion. However, people as far away as the Philippines were killed by this event. The costs of the damage were estimated to have been between $400 and $800 million in 1960 dollars, which would be about $3 to $6 billion today, adjusted for inflation. Earthquake damage at Valdivia: Photograph of buildings in Valdivia, Chile damaged by the earthquake. This photo shows houses located on an area underlain by fill. They slid downhill when the waterlogged soil beneath them failed. NOAA image by Pierre St. Amand. This is one of the few earthquakes that has killed large numbers of people at distant locations. Tsunamis generated by the earthquake traveled across the Pacific Ocean at a speed of over 200 miles per hour. Changes in sea level were noticed all around the Pacific Ocean basin. Fifteen hours after the earthquake, a tsunami with a runup of 35 feet swept over coastal areas of Hawaii. 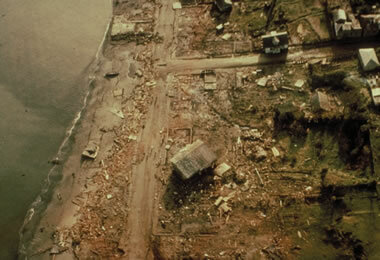 Many shoreline facilities and buildings near coastal areas were destroyed. Near Hilo, Hawaii, 61 people were reported killed by the waves. In California, many small boats were damaged as the waves swept through marinas. At Crescent City, a wave had a runup of about 5 feet and caused damage to shoreline structures and small boats. Waves up to 18 feet high hit the island of Honshu, Japan about 22 hours after the earthquake. There it destroyed more than 1600 homes and left 185 people dead or missing. Another 32 people were killed in the Philippines about 24 hours after the earthquake. Damage also occurred on Easter Island and Samoa. 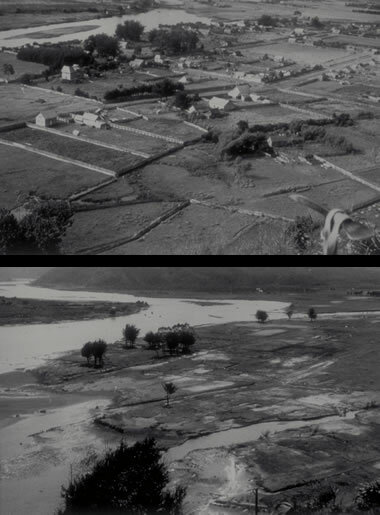 Tsunami damage at Queule: Before and after photographs of the village of Queule, Chile. This area was damaged by land subsidence and was inundated by the tsunami. Houses, boats, and uprooted trees were washed as much as a mile inland by a 13-foot-high tsunami. NOAA image by Pierre St. Amand. The United States Geological Survey reports that there was about five feet of subsidence along the Chilean coast from the south end of the Arauco Peninsula to Quellon on Chiloe Island. This left a number of buildings below water level at high tide. As much as ten feet of uplift occurred at Isla Guafo. This was a megathrust earthquake that occurred at a depth of about 20 miles, where the Nazca Plate is subducting beneath the South American Plate. It produced a 500-mile-long rupture zone extending from Talca, Chile to the Chiloe Archipelago. Numerous large earthquakes have occurred in this area before and after the May 22, 1960 event. Data from the United States Geological Survey. The earthquake was preceded by four foreshocks greater than magnitude 7.0. The largest was a magnitude 7.9 earthquake one day before that caused significant damage in the Concepcion area. 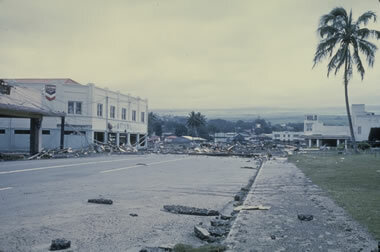 Tsunami damage in Hawaii: A photo of a tsunami-damaged area in Hilo, Hawaii. The area in the foreground was cleared of heavy machinery, mill rollers, and metal stocks that were strewn about by the wave. USGS Photo. Global seismic moment release: During the 100-year period between 1906 and 2005, three earthquakes accounted for nearly half of the world's total seismic release. 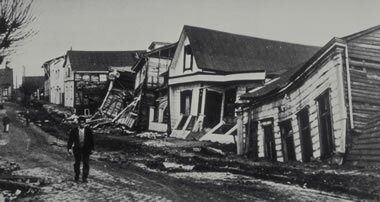 The 1960 Valdivia Earthquake accounted for greater than 20% of the global seismic release. The width of thin black wedge at slightly past 3:00 on the chart represents the release of the deadly San Francisco Earthquake of 1906. 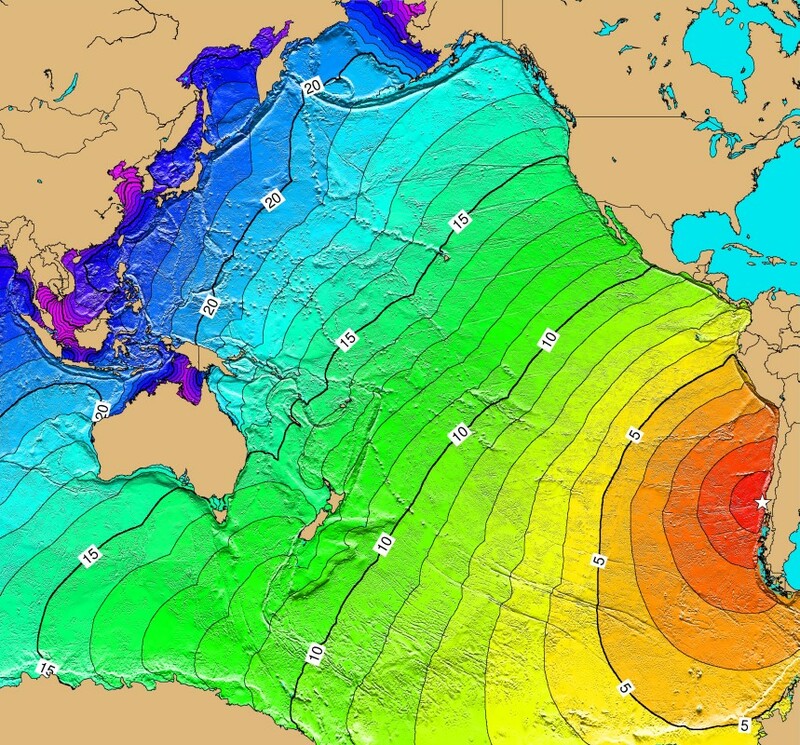 "A devastating earthquake (magnitude 8.6) off the coast of central Chile generated a tsunami affecting the entire Pacific Basin. In general the wave action along Hawaiian shores was quiet, resembling that of the tide, although it had a shorter period and a greater range. It killed 61 and seriously injured 43. In nearly half of this area total destruction occurred. In the area of maximum destruction, only buildings of reinforced concrete or structural steel, and a few others sheltered by these buildings, remained standing--and even these were generally gutted. Frame buildings either were crushed or floated nearly to the limits of flooding. Dozens of automobiles were wrecked; a 10-metric-ton tractor in a showroom was swept away; heavy machinery, mill rollers, and metal stocks were strewn about. Rocks weighing as much as 20 metric tons were plucked from a sea wall and carried as far as 180 m inland. Damage elsewhere on the Island of Hawaii was restricted to the west and southern coasts, where about a dozen buildings, mostly of frame construction, were floated off their foundations, crushed, or flooded. There was half a million dollars of damage on the Kona coast alone. Six houses were destroyed at Napoopoo. On Maui the damage was concentrated in the Kahului area on the north coast. A warehouse and half a dozen houses were demolished, and other warehouses, stores, offices, and houses, and their contents were damaged. A church floated 6.1 m away from its foundation. Other buildings were damaged at Paukukalo, just outside and west of the harbor. At Spreckelsville and Paia, east of Kahului, houses were damaged, and one house at each place was demolished. Additional damage occurred at Kihei on the south coast and Lahaina on the west coast. On the island of Molokai there was some damage to houses, fish ponds, and roads, and a beachhouse was demolished on the Island of Lanai. The islands of Kauai and Oahu escaped with only minor damage. Fifty houses at Kuliouou, an eastern suburb of Honolulu, were flooded, and $250,000 in damage was done. Elsewhere on Oahu no damage was reported, even where there was inundation of areas occupied by houses. On Kauai, so far as is known, the only damage consisted of one frame building being floated off its foundation on the south coast." Tsunami damage at Corral: Tsunami damage at Corral, Chile. Buildings that used to occupy this site were pushed back against the hills by the tsunami, and some were then carried out to sea by the receding waters. NOAA image by Pierre St. Amand. Subsidence damage in Quellon: This view parallels what used to be a waterfront street in the community of Quellon, Chile. This area subsided about six feet during the earthquake, flooding houses at low elevation. NOAA image by Pierre St. Amand. "The largest wave height in California was measured at the Crescent City tide gage was 1.7 m. Waves of 1.5 m were observed at Stenson Beach. The amplitude was more than 1.4 m at Santa Monica. The amplitude at Port Hueneme was 1.3 m and 1.2 m at Pacifica. The tsunami was recorded widely along the Pacific coast with amplitudes less than 1 m. Two vessels valued at $30,000 were lost at Crescent City. Major damage was reported in the Los Angeles and Long Beach harbors. An estimated 300 small craft were set adrift and about 30 sunk including a 24 m yacht which smashed into bridge piers partially disabling the bridge. The Yacht Center lost 235 boat landing slips and 110 more were destroyed at the Colonial Yacht Anchorage and Cerritos Yacht Anchorage for a loss of $300,000. A skin diver, Raymond Stuart, was missing and presumed drowned at Cabrillo Beach, but no death certificate was found. In the harbor currents estimated to be 22 km/hr snapped and washed out pilings. Many thousands of liters of gasoline and oil spilled from the overturn of the boats prompting fears of a fire. Several buoys and navigational aids were swept away at Terminal Island. The Coast Guard landing including the tide gage was washed 5.6 km to sea but was rescued. A mess boy fell 6 m from the bridge of the first ship to attempt to leave the harbor the next day. The ship returned to harbor so his injuries could be treated at the hospital. The accident was blamed on rough seas. At San Diego, ferry service was interrupted after one passenger-laden ferry smashed into the dock at Coronado knocking out eight pilings. A second ferry was forced 1.5 km off course and into a flotilla of anchored destroyers. More than 80 m of dock were destroyed. A 100 ton dredge rammed the concrete pilings supporting the Mission Bay bridge tearing out a 21 m section. A 45 m bait barge smashed eight slips at the Seaforth Landing before breaking in half and sinking. The currents swept 12 and 30 m floats from the San Diego Harbor Masters Pier on Shelter Island and swept away two sections of dockage at the Southwest Yacht Club at Point Loma. At Santa Monica the water fell so low that the bottom of the breakwater was nearly exposed. Eight small craft snapped mooring lines but were taken in tow. One surge swept more than 91 m up the beach flooding a parking lot just off the Pacific coast Highway. At Santa Barbara a drifting oil exploration barge repeatedly rammed the new dredge causing at least $10,000 in damage. An additional $10,000 was done elsewhere including damage to 40 small craft set adrift there."